Preserving Native Trees and Lasting Friendships | Small Farmers. Big Change. I showed the Huillca’s photos of Sparrow from last November, when she hosted a fair trade event at New Leaf Markets in Santa Cruz, which is the store she manages. And I went on to relate that she had been so sad to not make the trip but with a son starting college, it just wasn’t possible. “Well you give her a strong hug, give her two for one from Maria. And how great her son is doing so well,” Emilio said, and then turning to Eric Stromberg of the Davis Food Co-op, gave him a big hug and the two went on to talk about all that had passed since they had last seen each other ten years ago. “Now who are all our new friends?” Emilio asked, and I then introduced to the family Marie Wallace of Lifesource Natural Foods, Scott Owen of PCC Natural Markets, Kim Love and Francesca Siena of Mothers Markets, and Peter Mark Ingalls of Equal Exchange. Later we met up with the neighbors working together in ayni, which is a Quechua word used to describe communal work sharing. Six farm families will organize, and then for one day each week, everyone from all six families will work on one farm. The next day, a second family’s farm will benefit from the labor of all, and so on through the week. This system both makes work go faster, shares expertise, and builds community. The folks working today in ayni were working on Vircro Huilarca’s farm, and in addition to the Huillcas and the Huilarcas, the families involved were from the farms of Javier Gavino, Glores Condori, Porfilio Valenzuela, and Carlos Huillca. “Listen, what do you think about how now the private buyers who come by will take lower quality, anything we pick really, at a good price; but the co-op wants us to deliver higher quality and we’re not getting any more?” asked Porfilio. “Usually the price offered by private buyers might be the same as the co-op, but when you deliver to your co-op you get the reintegro (a second payment at the end of the year based on the actual selling price the co-op got for the coffee), but last year you didn’t get a reintegro, did you?” I asked back. “No, and the co-op hasn’t even set an advance price for this coffee we’re delivering today,” replied Porfilio. Nods of agreements and comments of “this is complicated stuff” and “it’s hard to manage, but at least prices are good and the harvest is good” followed for a few minutes until we all decided it was time to get back to work. We tromped down the path, with the Aguilayoc farmers shouting to their colleague to take us to the giant tapahuillca tree growing atop a nautral spring a few hundred meters away. “It must be a tropical hardwood then,” noted Marie Wallace as Gavino Garces described the many uses for the tapahuillca that soared above us. 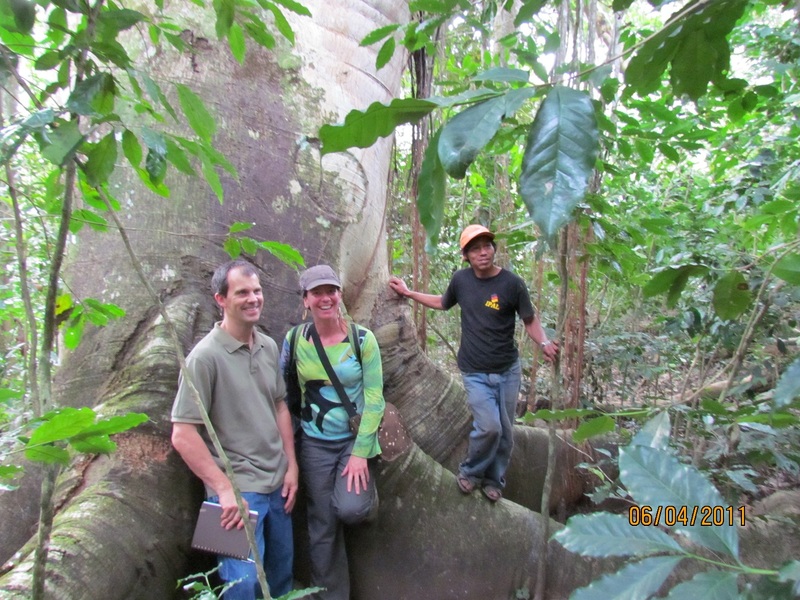 This majestic tree, likely hundreds of years old, is on the farm of Carlos Huillca. Carlos farms 6 acres of land that his parents Emilio and Maria bequethed to him a few years ago. The land contains over a dozen types of native tropical trees, including tapahuillca tree, that are being preserved on the coffee farm. The older native trees soar to 50-80 feet in high. Below that canopy, the limbs of the nitrogen fixing pakai and chamba trees that had been planted provided a canopy 15-30 feet above the ground. The coffee plants thrive under that perfect balance of shade and ventilation, fertilized by the abundant leaf litter, and stood 6-10 feet high and full of fruit. 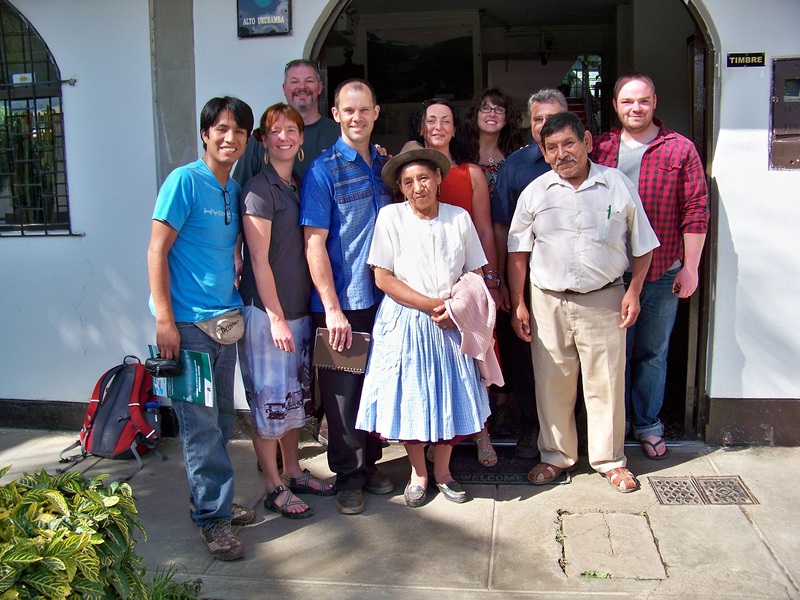 Our 10 days in Peru deepened friendships and strengthened partnerships despite the many changes that have occurred since June 2001. We suspect that if we return again 10 years from now, the giant tapahuillca tree will be the only thing unchanged.